As I was finishing up my day in the office yesterday I made a last pass through TenForums.com. I noticed there that Insider Preview Build 15014 was out. But, alas, I failed to read the covering blog post. Had I done so, I could’ve saved myself some wasted time and effort. Turn out that the progress bar for downloading the latest Upgrade is broken. So when I started updating and didn’t see any progress on my desktop test machine, I immediately presumed “Another issue with WU.” This led to evasive action that ultimately forced me to restore a backup and then reapply the upgrade (successfully) later on. And that’s how I found myself able to observe that impatience imperils progress on 15014 upgrade maneuvers, as noted in this blog post’s title. You could understand this self-inflicted problem as an “RTFM error,” if you like. But it actually helped me in a couple of interesting and unexpected ways. For one thing, I found myself dealing with the dreaded “black screen of death” on Windows 10. It’s something I’ve read about a lot, but haven’t troubleshot too often. First, I tried to see if the OS was available enough in the background without a working display to launch Task Manager. That meant entering Ctrl-Alt-Esc at the keyboard, then striking Alt-F to open the File Menu. An “R” launches the Run box, which one can use for a variety of tasks. I tried re-launching Windows Explorer, then a shutdown command. Nothing doing. My machine was pretty hosed, it seemed. Eventually I did reach my ultimate goal: getting 15014 installed. Next, I turned to my old reliable backup program, Macrium Reflect Free. It thoughtfully installs its console as a boot option on the Windows OS boot screen, so I happily fired it off. Inside the Macrium-based Recovery Environment it provides, I found my way to an image of the wonky disk I’d made on January 13. It took just a few mouse clicks to get the restore operation going, and about 10 minutes to complete the job. After that, the machine booted immediately so I could start all over again. I did fine on the second two items in the list (I’d learned them the hard way a long time ago). But I’ll have to do better on the first two going forward so I don’t get caught unaware. That’s modern life in Insider Preview land! I don’t want to have to rewrite “Impatience Imperils Progress on 15014 Upgrade” for some other build number, too. 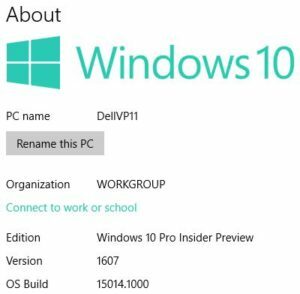 This entry was posted in EdFiles, Tips, Tricks and Tweaks, Windows 10 by Ed Tittel. Bookmark the permalink.